1) Do I need to make a reservation for a guided fishing trip? 2) What size group can you accomodate on a guide trip? 3) What time of year is best to go on a guided fishing trip? 4) What do I need to bring on a guided fishing trip? 5) Do I need to bring my own flies and gear? 6) Are meals included on guided fishing trips? 7) What is your cancellation policy? 8) Where do your guided fishing trips take place? 9) How much is a guided fishing trip? 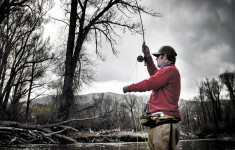 10) Do you only do fly fishing guide trips? 11) Do you provide lodging on guided fishing trips? 12) How far are you from Denver? 13) Can I customize my fishing trip? 14) Where are you located? Although reservations are not a necessity, it is highly suggested that you contact us as soon as you know your travel plans. With a reservation we can assure you that you will be able to fish the exact dates that you want. We do only a select number of guided fishing trips every year to ensure the quality and enjoyment of each trip. If you would like help in picking the best time to fish with Four Seasons Anglers or to see if a date is available please give us a call at 307-721-7-4047 or email us. Four Seasons Anglers is experienced in planning for and accommodating large groups of fishermen. We will take care of all the details of your fishing vacation, including meals, lodging, entertainment, and recreation. We have numerous experienced local guides at our disposal, which ensure that everyone you are fishing with has a quality fishing experience. If you would like to inquire about booking a trip for a large group please give us a call at 307-721-4047 or email us. That is a muliple level question. First, it depends on what type of water you wish to fish. We have multiple waters to choose from including, the upper North Platte River, the Gray Reef, the Miracle Mile, the Big Laramie River, and of course our Private Stillwaters. Each of these fisheries can fish well at different times of the year. Second, it depends on what kind of fishing you prefer. Certain times of the year fish better with different fishing methods. For instance, chucking streamers at the banks of the upper North Platte for large browns and rainbows is best in the spring, just before and after the runoff, and agian in the fall. 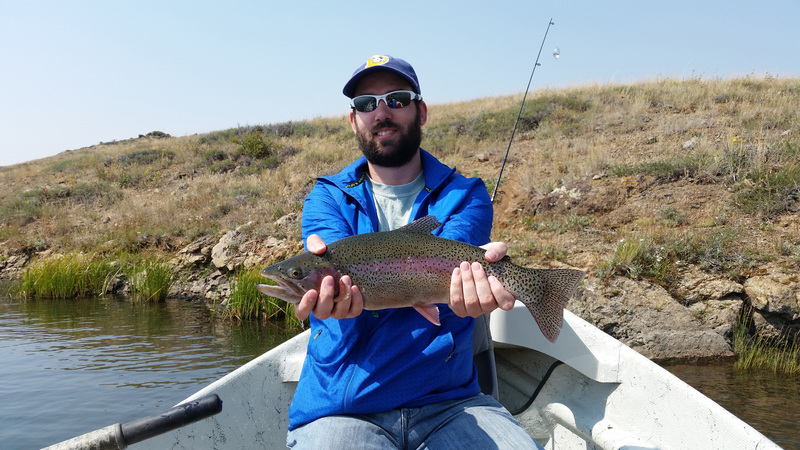 If you’re a dry fly fisherman, the beginning of June through the middle of July and again is September for the Tricos, is the best time to fish southeast Wyoming. Third, any time you can get away it is a good time to go fishing. We can always assure you a place with good fishing prospects and if we can’t we will be upfront and honest about the current fishing conditions. We will not try to talk you into a trip when there is no chance of catching fish or if the conditions are not up to par. To get up to date information on how the fisheries in our area are fishing or to check on available dates for a guided trip give us a call at 307-721-4047 or email us. For more information on our local waters click here. Most of the things you should bring are things that you would bring on any trip taking place outside. Below is a list of the things that you will want to have with you on a guided fishing trip with Four Seasons Anglers. Please don’t hesitate to contact us with any questions about what to bring by calling us at 307-721-4047 or email us. 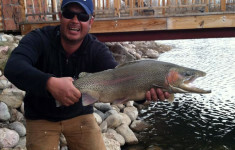 WYOMING FISHING LICENSE You will need a Wyoming fishing license at all our destinations. POLARIZED SUNGLASSES This is the one piece of equipment I refuse to fish without. RAIN GEAR It’s nice not to get figid cold because of a brief Wyoming afternoon shower. WARM CLOTHING It can cold just about any month in Wyoming. If you plan to fish with us from April through May or in the fall make sure you have a warm hat, gloves, windbreaker, and multiple layers, just in case of bad weather. WADERS You will definitly want waders if you plan to do any wade fishing with us in the spring and fall but they are also a great way to keep dry if does decide to rain. During the months of June, July and August the water and air temps are usually comfortable for wet wading. If you don’t own a pair of waders we can make arrangements for you to borrow a pair or we can point you in the right direction on the purchase of a new pair. RODS Bring your favorite 4 to 7 weight rod. If you don’t have a fly rod we can loan you one during your guide trip or help you decide on a fly rod that would work best for you in our fly shop. If you plan to spin fish we ask that you bring your own spinning rod and tackle. CAMERA You will definitly want to bring along a camera to capture the Wyoming wildlife, scenery, and of course the fish on your guided trip. Make sure you have solid physical evidence to show your friends and family when you get back from your trip. Your guide will also have a camera to capture the more candid moments. PERSONAL NECESSITIES Please remember to bring any medications or personal necessities on your guided trip including, sunscreen, bug spray, eye drops, insulin, heart pills, or headache medicine. Your guide will have a First Aid Kit but it will not be equipped for major medical needs such as diabetes. We supply all the flies and tippet material during your guide trip for FREE, but if you have any flies or fishing gear that you would like to use on your trip please bring it along. We feel that confidence in your gear and especially your flies is very important in how well you present them to the fish and in turn how productive they are. For more information on what flies work best on certain fisheries in southeast Wyoming give us a call at 307-721-4047 or email us. Lunches are included on all full day guided float and wade fishing trips. If you have special menu concerns such as diabetes or food allergies please let us know so we can take the appropriate precautions. Half day trips include beverages (water and softdrinks) and snacks only. If you would like to arrange to have a lunch on a half day trip for a small fee please let us know when you book your trip. Meals in our multi day trips varry depending on how many days of fishing and your prefernce. Some of our clients enjoy visiting some of the local establishments for breakfast and dinner. Please call us at 307=721-4047 or email us to customize your trip. Cancellations must be recieved 2 weeks prior to booked date to receive full refund. Any other cancellations will be handled on an individual basis. best trout fishing. This portion of Wyoming is home to the famed upper North Platte River, the Gray Reef stretch of the North Platte, the Miracle Mile of the North Platte, the Encampment River, the Big Laramie River, the Laramie Plains Lakes, and our private stillwaters. It is this great diversity that allows us to ensure that we will have good fishing somewhere around Laramie. To learn more on each of these fisheries please take a look at Our Waters page, give us a call at 307-721-4047, or email us. Please call us at 307-721-4047 or email us for more information on prices for Corporate Group Trips and Scenic Float Trips. No. We gladly take anyone who would like to fish the great waters of Wyoming. Spinners and Rapala’s work very well on some over our bigger rivers, especially the North Platte. We do follow the Wyoming Game and Fish regulations on what type of bait or lures are permitted on certain fisheries. If you would like to fish with something other than a fly rod please don’t hesitate to ask. Spinning rods and lures can be provided by making the needed arrangements. Please call us at 307-721-4047 or email us to arrange a trip with a spinning rod. We provide lodging on our North Platte Overnight Fishing Trip and the Wyoming Trophy Trout Trip but not on any other trips. 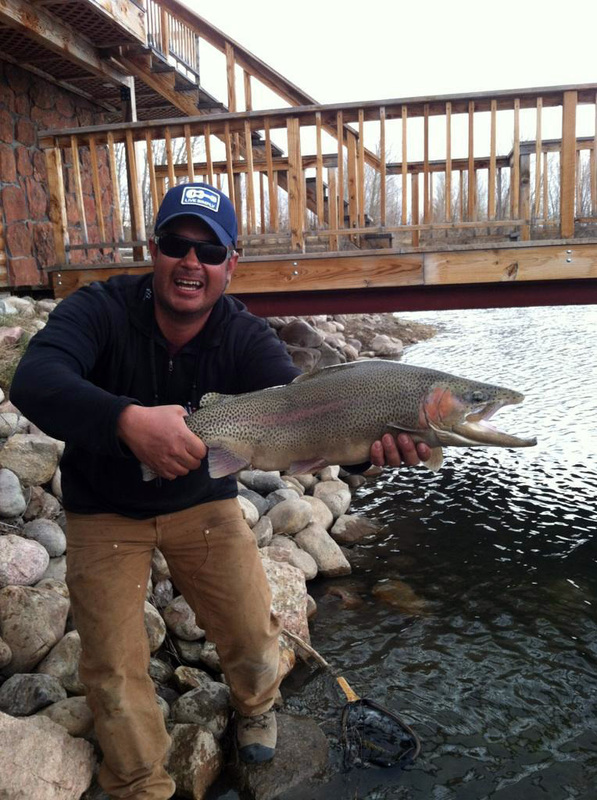 Four Seasons Anglers can arrange lodging at the only lodge on the upper North Platte. This fishing lodge is perfect for a couple looking to escape the hassles of every day life or for the long time group of fishing friends that wants a place all to themselves. Meals, guides, and private access come with a stay at this lodge. For more information on the amenities availabel at this lodge click here. There are plenty of Hotels and bed and breakfasts in the Laramie area. If you would like assistance in finding and setting up lodging for the night before or after your fishing trip please give us a call at 307-721-4047 or email us. To look at some of the lodging available in Laramie click here and in Casper click here. 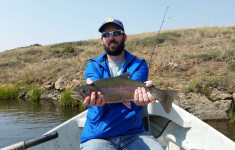 Four Seasons Anglers, located in Laramie Wyoming, is approximately 120 miles from Denver and only 60 miles from Fort Collins and the front range of Colorado. For more information please give us a call at 307-721-4047 or email us. Four Seasons Anglers can customize your trip in any way you would like. Please let us know what it is you would like to do on your fishing trip and we will do our best to make it happen. Please give us a call at 307-721-4047 or email us with any ideas you have. 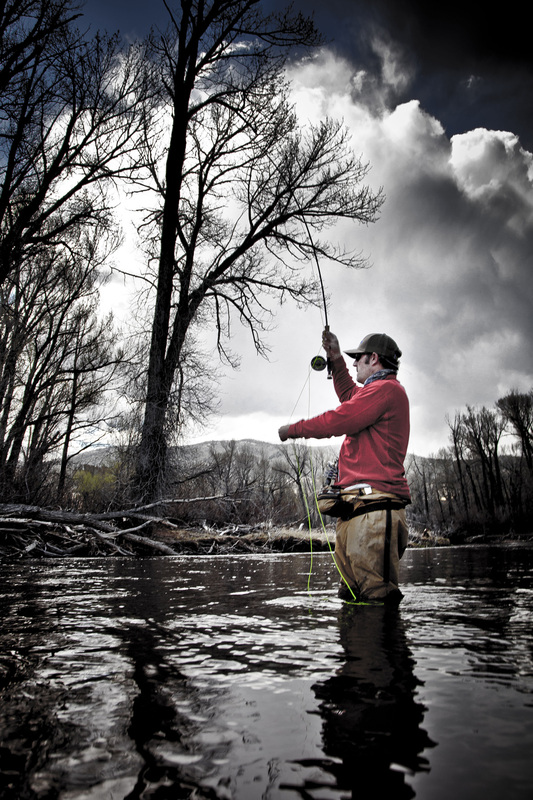 Four Seasons Anglers is located in Laramie Wyoming, home of the University of Wyoming. We are approximately 120 miles north of Denver Colorado and 50 miles west of Cheyenne Wyoming. Our shop is just off Interstate 80 at the Snowy Range Exit (exit #311) in Laramie. We are to the west of the I-80 on the north side of the road just passed Mc Donalds and connected to the Wagon Wheel Liquor Store.